WINSTON-SALEM, N.C. (Jan. 22, 2019) - The Chicago White Sox have announced that 11 former Winston-Salem players, including eight 2018 Dash stars - Bernardo Flores, Luis Gonzalez, Jimmy Lambert, Nick Madrigal, Nate Nolan, Luis Robert, Blake Rutherford and Zach Thompson - have earned non-roster invitations to Spring Training. Catcher Zack Collins, left-hander Jordan Guerrero and infielder Danny Mendick will join the other non-roster invitees in Glendale, Ariz., next month. 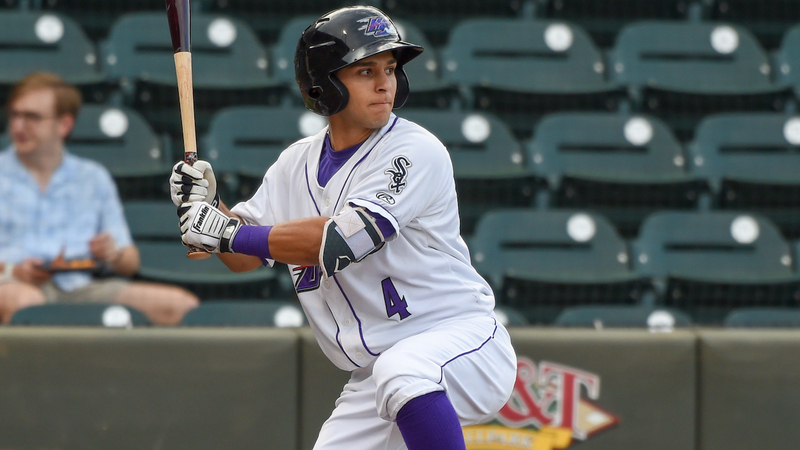 A seventh-round pick by the White Sox in 2016, Flores spent the first half of the 2018 season with Winston-Salem. One of five Midseason Carolina League All-Stars with Winston-Salem last year, Flores posted 10 quality starts in 12 outings at the High-A level. He finished with a 5-4 record and a 2.55 ERA before being promoted to Double-A Birmingham. After garnering a Midseason South Atlantic League All-Star nod with Low-A Kannapolis, Gonzalez was promoted Winston-Salem before the start of the second half. The former third-round pick out of the University of New Mexico proceeded to post an impressive .880 OPS in 62 games with the Dash. Gonzalez finished the season with a combined batting average of .307, good for fifth-best among White Sox farmhands. Lambert, who was selected in the fifth round by the White Sox in 2016, flourished in his second stint with the Dash. Last season, the right-hander posted 80 strikeouts in 70.2 innings while yielding a 3.95 ERA. Before an injury sidelined him for the rest of the year, Lambert recorded a 2.88 ERA in five starts with Birmingham. Selected with the fourth overall pick by the White Sox in the 2018 MLB Draft, Madrigal joined the Dash in early August. A key cog for the 2018 College World Series champion Oregon State Beavers, Madrigal registered a .306 average in 26 games at the High-A level. The 21-year-old also struck out just five times in 43 combined Minor League games. Nolan spent all of 2018 with Winston-Salem, where he played 50 games before a season-ending injury halted his year. The backstop hit three homers and 20 RBIs for the Dash. Behind the plate, Nolan nabbed 17 would-be base stealers. Rated the 44th-best prospect in baseball by MLB Pipeline, Robert played in 32 games with the Dash in 2018. The White Sox signed the 21-year-old for $26 million in May of 2017, which was the second-largest signing bonus for an amateur player, only trailing current White Sox second baseman Yoan Moncada. Rutherford led all Dash batters with 131 hits and 78 RBIs in 2018. A former first-round pick with the Yankees, Rutherford was one of three Year-End Carolina League All-Stars for the Dash after finishing with a .293/.345/.436 batting line. Thompson, who also pitched for the Dash in 2016 and 2017, dominated out of the bullpen last year with Winston-Salem. The right-hander had a 1.78 ERA in 22 outings, striking out 36 batters in 35.1 innings pitched. A fifth-round pick by the White Sox in 2014, Thompson was promoted to Birmingham to start the second half, where he yielded a 1.35 ERA in 21 outings. Collins, the first of two first-round picks for Chicago three years ago, spent time with the Dash in 2016 and 2017. The former Miami Hurricane hit his first professional home run with Winston-Salem in 2016. The following year, Collins swatted 17 home runs and posted an .808 OPS before his promotion to Birmingham. Last season, Collins hit 15 homers with the Barons. Guerrero, who was drafted in the 15th round by Chicago in 2012, spent his lone stint with Winston-Salem in 2015. Thanks to a 7-3 record and a 3.56 ERA, the southpaw helped the Dash earn a second-half Southern Division title. Last year, Guerrero went 7-2 with a 3.46 ERA in 12 starts with Triple-A Charlotte. Mendick played for the Dash in 2016 and 2017, earning a Midseason Carolina League All-Star nod in the latter season. The 25-year-old recorded a .289/.373/.468 batting line with seven home runs and 30 RBIs in 84 games with Winston-Salem in 2017. Pitchers and catchers report to Spring Training on February 13, while position players will be on hand by February 18. The Dash's 2019 season begins on Thursday, April 4, with the opener of a week-long road trip. Meanwhile, Winston-Salem kicks off its 10th anniversary season at BB&T Ballpark on Thursday, April 11, against the Potomac Nationals. Full- and partial-season ticket packages are on sale now. For more details, call (336) 714-2287 or visit wsdash.com.